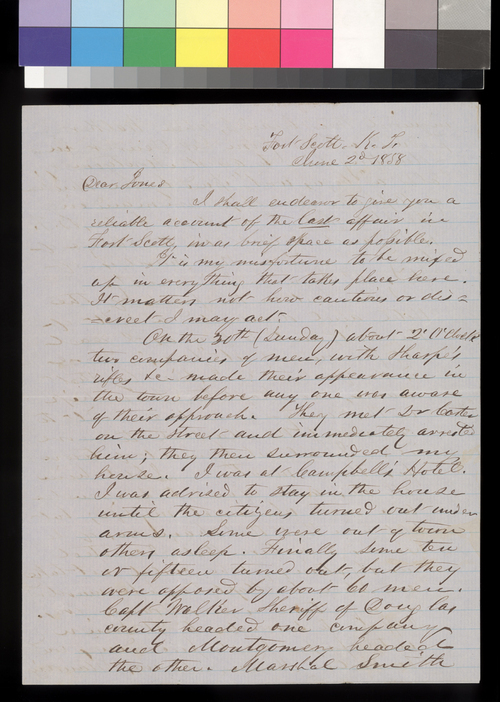 Writing from Fort Scott, Kansas Territory, to Douglas County Sheriff Samuel J. Jones, George W. Clarke describes a May 30, 1858, incident in which Deputy U.S. Marshal Samuel D. Walker attempted to arrest him as a suspect in the Marais des Cygnes Massacre. Clarke declares that he was innocent of the charges, and views Walker's arrest warrant as a "bogus writ." Clarke initially resisted arrest but claimed that he agreed to surrender to Lieutenant Shinn of the U.S. Army to prevent violence between Fort Scott residents and Walker's men. Clarke also describes the unsuccessful efforts of angry Fort Scott residents to convince Walker to arrest James Montgomery. People - Notable Kansans - Jones, Samuel J.